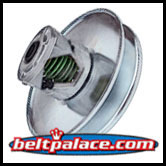 Comet 300782-C Secondary Pulley. 780 Series, 7/8" Bore. 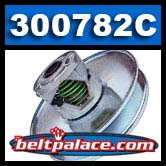 Comet 300782C Secondary Pulley for Land Pride, Recreatives Industries Max ATV-UTV's, and more. Comet/Salsbury 780 DVN, 7/8" B, 9.25 Dia, 32deg Cam, 3/16" Keyway, Green torsion spring. OEM for Land Pride/Recreatives Industries, et al. Comet 302469A Clutch. Comet 1195 Series drive clutch for Recreatives Ind Max ATV's. Comet 302469A Primary Clutch. 1-1/8" Bore. Comet 1195 Series drive clutch for Recreatives Ind Max ATV's.